After our family vacation to Lake Havasu last November I wasn’t feeling very encouraged to take my kids anywhere far away EVER AGAIN!! The fighting, the whining and the overall bad behavior made me want to scream. However, as is the case with past years, spring time in Cedar City was getting to be more than I could bare. The time had come to go south for a real vacation. As Logan and I began making preparations for hotel rooms, travel routes, and possible destinations I realized we would be spending a very large amount of time in the car and my plans for traveling with children would definitely have to improve from the last vacation. 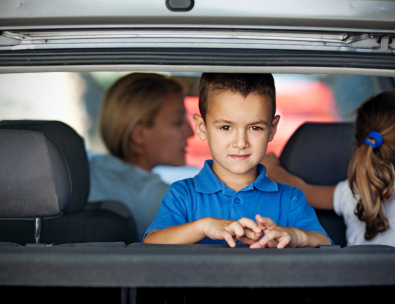 Long car rides and children do not necessarily go hand in hand but they SHOULD be possible. My parents took our family on road trips all the time and that was long before the days of DVD players. I knew this objective had to be possible. After analyzing the failure of our vacation over Thanksgiving I determined three major flaws with my ever so careful plans. The first mistake I made was food. Last trip I brought a bag of treats, just like I always do, but most of the treats were just that…. Treats rather than food. As much as we all like to believe that kids will do anything for candy sometimes they are just hungry and need something substantial to eat. Solution number one was to have some ‘real’ food readily available. We put away all the candy, granola bars and fruit juice, instead we ate grapes, oranges, water, pretzels, cheese, yogurt, nuts and plain old slices of white bread. Problem number two came as a result of poor entertainment choices. I tried to think back to the road trips I took as a child to determine what types of things we did to keep busy and nowhere on my list was there an Ipad, a DVD player, or any other electronic form of zoning out the conscious mind. I do remember singing songs, reciting nursery rhymes, playing memory/mind games, and listening to books on tape (tapes are those little rectangular objects with, well, tape inside of them). 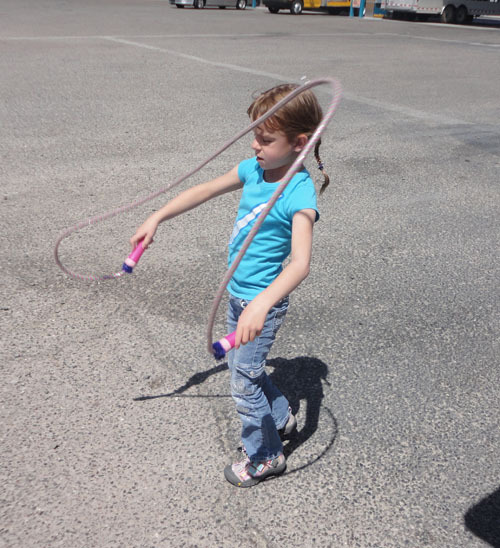 We tried all of these things and they did wonders for keeping the kids brains active. I also remember my parents letting us buy toys while on vacation and our new toys became the focus of our attention, leaving little time for being bored. Of course buying toys only works to keep a child’s mind busy if they are not use to getting new toys ALL THE TIME. My kids typically only get new toys on their birthdays, at Christmas, and on big vacations so this works well for us. 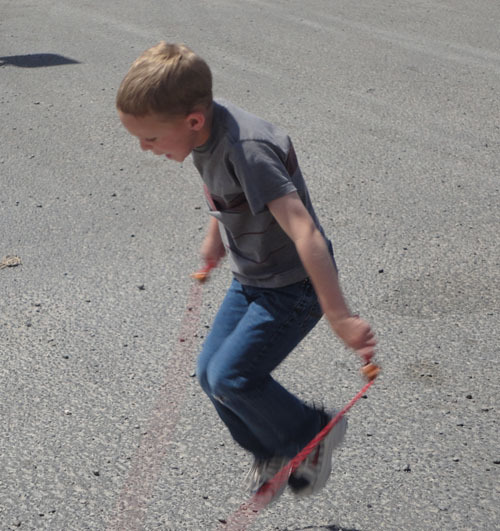 I also realized that stopping for food and bathroom breaks just wasn’t enough to get the wiggles out so in addition to pulling out the old car tricks of the 1980’s I threw in a few jump ropes and a football. Each time we stopped, for whatever reason, the kids spent ten minutes physically moving their bodies before getting back in their seatbelts. This did wonders for their emotional state of mind. Exercise really is a mental cure all! Our third issue we face when traveling with children is fighting. As much as I understand that unenforceable threats are counterproductive I often feel powerless when trying to get my kids to behave in the car. I can’t send them to their room, I can’t take away their favorite toy, I can’t even tell them they have to wash the walls as punishment. In reality, I have NOTHING! No bargaining power what-so-ever while riding in the car. I have considered the phrases “don’t make me turn this car around” or “If you don’t stop you’ll have to get out of the car seat you HATE to be in”. But they are all useless. Having three small children sitting practically on top of each other for 8 hours is bound to cause bickering. He stole my toy, she hit me, he made me spill my water, I want that book, etc, etc, etc. I just couldn’t deal with it this time!! To solve the fighting problem I did two different things. First, I did my very best to keep the middle seat where the kids sit as clean as possible. In the past I have been known to stuff bags, or blankets, or even trash under the kids’ feet. Then I realized I would be in a fighting mood under those circumstances as well so the only things surrounding the kids were their shoes and the things THEY put there; I kept everything else out of their way. My second solution was the money game. Our rules for Disneyland have always been that the kids could pick one toy at the end of the day as we were leaving the park. This year they had to earn the money they were going to spend rather than me just giving it to them. So, before we left I got each kid 20 one dollar bills and clipped them together. NOW I had bargaining power. 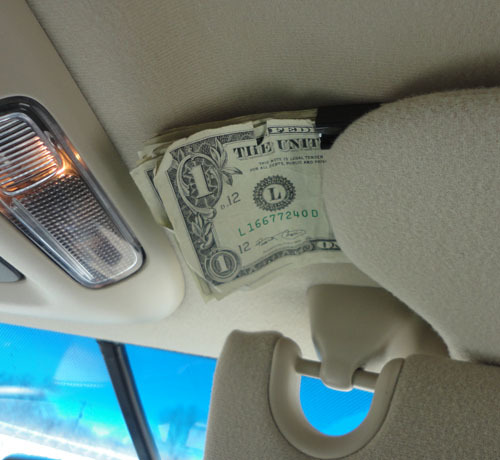 I explained that every time I heard fighting or whining or other inappropriate behavior coming from the back seat I would simply take away a dollar. When a fight was just beginning to erupt I would simply say, “you guys had better work it out like big kids unless you want to lose a dollar”. If I heard comments like “NO, don’t take away a dollar” I immediately took away ANOTHER dollar. This was a physical action that the kids WATCHED me do, there was nothing theoretical about them losing their Disneyland money, they saw me take the money out of the clip and put it in my wallet. I know as well as the next guy that you can’t buy anything at Disneyland for less than 20 dollars so I made it possible for the kids to ‘earn’ their dollars back by doing something EXTRA great like, helping their little brother or picking up the motel room or getting out of the swimming pool the FIRST time they were asked. The game worked like a charm! On the day we were at the Wild Animal park in San Diego C7 was very tired and becoming really difficult, he lost about 4 dollars before he realized his behavior wasn’t getting him anywhere and he mellowed out. The best part about it was that it took him a full day and a half of being really great to earn back the dollars he lost during a 30 minute melt down. Traveling with children can be stressful but it can also be a whole lot of fun! With a bit of extra planning on my part and a little creativity we had a great trip where everyone was happy, most of the time, and we all made it home feeling refreshed and rejuvenated for everyday life. Vacations are a mental necessity for me but when done incorrectly they can become more of a burden than a refreshment. 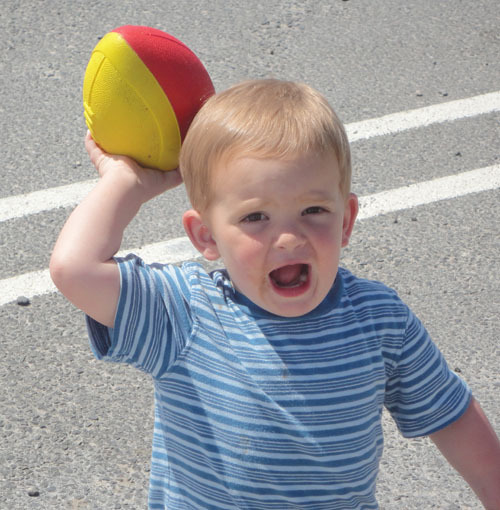 This entry was posted in Projects and tagged Kids, Parenting, Travel.